WOMEX is delighted to present its first ever in-house curated film programme. 15 striking documentaries co-produced in 19 different countries ranging from Greenland to Vanuatu shall be screened – new releases that portray music, movements and history from across the world. Many of the films selected will enjoy their European or Hungarian premieres at WOMEX 15 in Budapest. Films will be presented at both Bálna and Müpa Budapest (Palace of Arts), during the day and in the evenings respectively. For a full listing of the films that will be screened, as well as more information about each film, see the Film programme webpage. 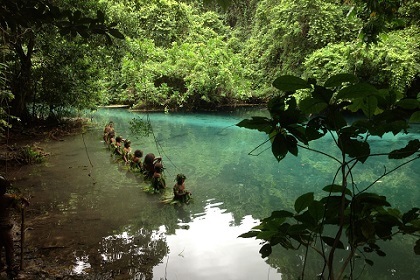 Picture credit: Still from the film Vanuatu Womenʼs Water Music, directed by Tim Cole.